The name says it all--trash compactors can compress your household garbage to as little as 75 percent less volume using a motor and a ram. Because the ram doesn't go all the way to the bottom of the compactor, you need to fill it at least half way before turning it on. 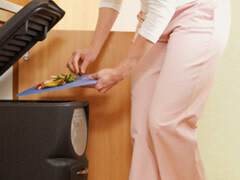 The trash is stored in a neat compactor bag that is easy to dispose of. This means you'll be taking out the trash a lot less often! Trash isn't the only thing that has been compacted--the compactors themselves have gotten much smaller, so if you have a tiny kitchen, you can still find a machine that will fit. They come in sizes as little as 11 inches, although the standard size is 15 inches. Trash compactors come in under-the-counter styles, which may require some renovating to get them installed and freestanding models, which do not. Freestanding models have the advantage of finished tops, so you get some extra counter space. There are also portable models, which can be moved from kitchen to craft room and stored anywhere you like--many people prefer to keep them in the garage, where they take up no kitchen space at all. Finally, there are manual trash compactors, which cost little more than a good garbage can. These are nice for boats and RVs but not suitable for home use because there is no motor, so you don't have a lot of compacting power. You want to get a unit powerful enough for your needs. In general, more is better, but you may have to balance that with size and price considerations. Compacting ram force is measured in pounds, and this force ranges from 2,000 to 5,000 lbs. depending on the model. If you plan to crush plastic bottles and cans in addition to other perishable trash, you should opt for a 5,000-pound ram force model. Those with less crushing power are simply not adequate for heavy-duty compacting jobs. Trash compactors come in many finishes, and can be chosen to complement your kitchen's style. Currently, stainless steel is a popular choice for modern kitchen appliances and can give your kitchen a sleek and elegant look. Other options include solid-colored compactors and those with reversible panels which can be selected to go with stained wood or painted cabinetry. There are many competing brands, which helps keep prices reasonable. In addition, competition keeps companies innovating and improving their products. Some of the most popular brands of compactors include Broan and Kitchenaid. Others include GE, Maytag, and Whirlpool. Bags for these machines are also produced by all these companies, and you can often find great bargains if you hunt around. New installations cost more than replacement trash compactors. On average in the U.S. it costs between $581 and $752 to put in a new unit. Portable trash compactors range in price from $550 to $655 for an average unit, and freestanding models cost anywhere from about $600 to over $1,300, depending on the style, finish, and features. Decide what's most important to you--there are some trade-offs with convenience, comfort, and price--and then comparison shop to get the best price. The form on this page is a great place to start your search for more information and for price quotes.